The tremendous scalability, flexibility, and speed of Infrastructure-as-a-Service (IaaS) make it one of the fastest-growing sectors of the cloud computing markets.Security and compliance, however, remain major challenges to adoption of public cloud infrastructure services. Usage agreements and documentation squarely make the user of IaaS, not the provider, responsible for protecting servers, applications and data in the cloud - essentially everything from the virtual machine OS upward in the stack. 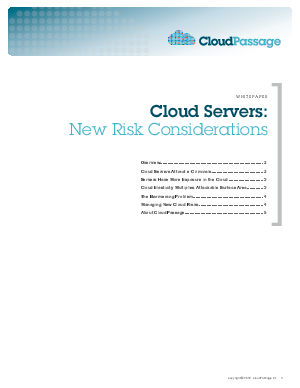 Read this white paper to learn more of the new risk considerations and major challenges of cloud.